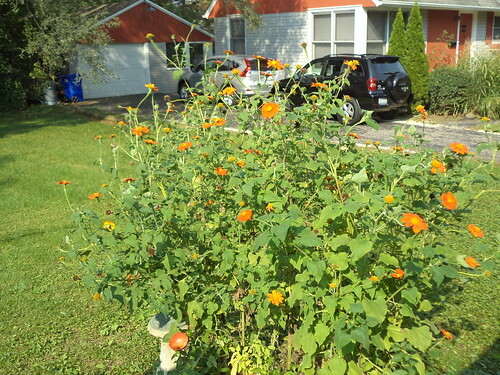 A last couple of posts about the Mexican sunflowers I planted last spring. They were so happy in the raised bed. They easily topped out at the 6 foot maximum height listed on the packet. 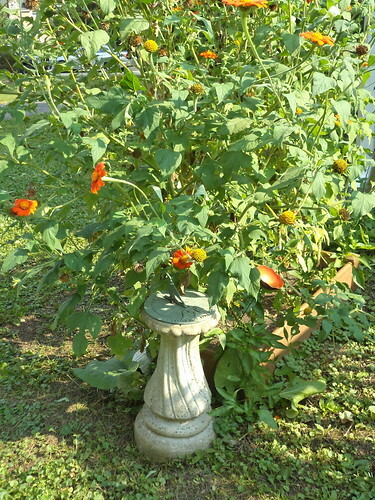 There were so many flowers which, as I posted earlier were enjoyed by hummingbirds AND by monarch butterflies. They took over the raised bed. It was glorious. I do feel that glory belongs in the front where others can see it. Plus, I can use the raised bed to grow foodstuffs. So, I'll try to be better about blogging with photos this year so you can watch their progress as they grow.